This thought-provoking study by historian Monique Laney focuses on the U.S. government–assisted integration of German rocket specialists and their families into a small southern community soon after World War II. In 1950, Wernher von Braun and his team of rocket experts relocated to Huntsville, Alabama, a town that would celebrate the team, despite their essential role in the recent Nazi war effort, for their contributions to the U.S. Army missile program and later to NASA’s space program. 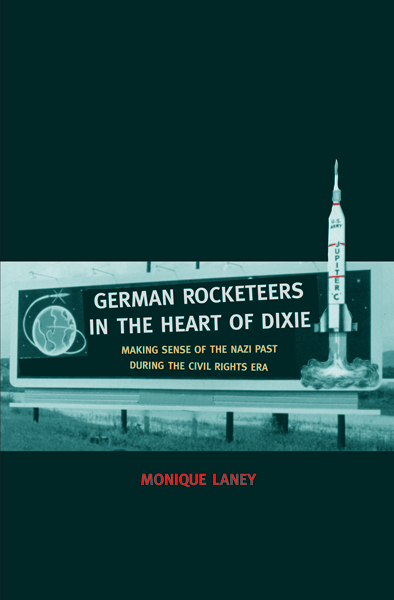 Based on oral histories, provided by members of the African American and Jewish communities, and by the rocketeers’ families, co-workers, friends, and neighbors, Laney’s book demonstrates how the histories of German Nazism and Jim Crow in the American South intertwine in narratives about the past. This is a critical reassessment of a singular time that links the Cold War, the Space Race, and the Civil Rights era while addressing important issues of transnational science and technology, and asking Americans to consider their country’s own history of racism when reflecting on the Nazi past. Monique Laney is assistant professor of history at Auburn University. She lives in Auburn, AL. Winner of the American Institute of Aeronautics and Astronautics 2016 Gardner-Lasser Aerospace History Literature Award. Won honorable mention for the Deep South Book Award sponsored by the Frances S. Summersell Center.